This is the final part of my examination of child employment in the silk industry. I have already covered the background of the industry, numbers of children (Part 1), type of work undertaken, children’s ages, working conditions, health (Part 2) and the impact of the Factory Acts (Part 3). In this post I will focus on the peculiarities of the industry, and how these ultimately affected the numbers of child workers employed in it. The peculiar circumstances which made legislators wary of interference are related to the uncertain economic nature of the silk industry. These vagaries probably account for the greatest part of the decline in child employment. A recurrent theme in the various Commissions and Select Committees was the factory owners’ protestations that child employment was an absolute necessity if the English silk industry was to compete with foreign trade. The mid 1760’s to 1826 marked a period of protection for the English silk industry. Fully manufactured foreign imports were prohibited and duties on other silks were proportionately high. Even though smuggled goods did manage to sneak in, this prohibition bolstered an industry incapable of thriving on its own merit. From 1815 onwards, following the end if the Napoleonic Wars, French silk started to arrive in the country in greater quantities and initially caused a slight slump in the home grown industry; however by the early 1820’s it had picked up. The major blow came in 1826 when a new, lower tariff came into operation. This was further reduced in 1828 and 1845, becoming a 15% ad valorem duty on manufactured silk. It was finally abolished for French imports in 1860 with the Anglo-French treaty, signalling a move to European free trade. French manufactured silk, in particular, was superior to British produced silk. Macclesfield, the major silk manufacturing centre in England, suffered a terrible depression between 1826-31. It is estimated the numbers engaged in silk manufacture fell from over 10,000 to under 4,000; wages were less than half their former rate; under-employment and short time became prevalent; and the number of silk factories in operation fell from 70 in 1826 to 41 in 1832. Over-expansion in previous years due to protection was in part to blame. Additionally the lowering of duties left the country open to competition from areas much better suited to silk manufacturing. The 1831-32 Select Committee into the trade heard from a series of mill owners describing the terrible conditions. The depression and loss of trade was attributed to “the introduction of foreign thrown silks; to the introduction of manufactured silks which both oppress the throwster and manufacturer, from having goods brought in, the manufacturer has less demand for manufactures, and the throwster has again to compete with the introduction of foreign silks.” These were the words of Thomas Willmott, a Sherborne manufacturer, in his evidence to the Committee. The government took no action in terms of increasing duty. However, the following year, the dire circumstances of the silk trade was taken account with the special treatment afforded it with the introduction of the 1833 Factory Act. It is also probable that the decline of child employment in the silk industry in the 1830’s was symptomatic of the trade in general: parents possibly chose not to send their children to work in it because of the depressed wages. The 1860 Franco-British Treaty allowed the duty-free importation of French silk goods. They were cheaper and of far better quality than indigenous ones, so this had a profound impact causing further contraction to the industry at home. Fashion fads also played a part in the domestic decline. When French products became more widely available, a corresponding preference for French styles and gowns followed, particularly between 1851-1871. A further factor to be taken into consideration is disease, pébrine, affecting silkworms. This became particularly troublesome between 1853-68 in France and looked like spreading. The disease caused a dramatic drop in silk production until 1868 when the bacilli was isolated and a cure found. Incidentally Louis Pasteur, the French chemist and microbiologist better known for his discovery that germs caused disease, and his work with pasteurisation and vaccines, was instrumental in establishing the cause and elimination of the disease. In conclusion, the silk industry was a unique branch of the textile industry. It was more susceptible to trade and trend reversals than many other branches due to the luxury nature of the goods produced. This, above all other reasons, caused the decline of the industry as a whole and, by extension, child employment. Factory Acts in the period covered in this study did affect the silk industry, but only in a limited part. Vast, unregulated areas still existed in raw silk throwing and winding as well as in a domestic setting. And the reasons these were left unregulated related precisely to the peculiar circumstances of the industry. Once you get into your family history, you progress from names and dates to finding about the lives and times of your ancestors. Their employment is a significant part of this discovery process, because it formed a big part of their lives. And although not quite cradle to grave, this work was often from early childhood. The first time l looked at censuses in any detail was over 30 years ago to produce an analysis of child employment in the silk industry between 1815-1871. Although I do have ancestors in the textile industry, so far I’ve not discovered any in the silk branch. It was also the first time I looked at the various parliamentary inquiries into child employment, and discovered what a wealth of information they supplied about working conditions and employment practices. And this in the words of those involved – employers and employees. So a name-rich source to which you may find an ancestor gave evidence. 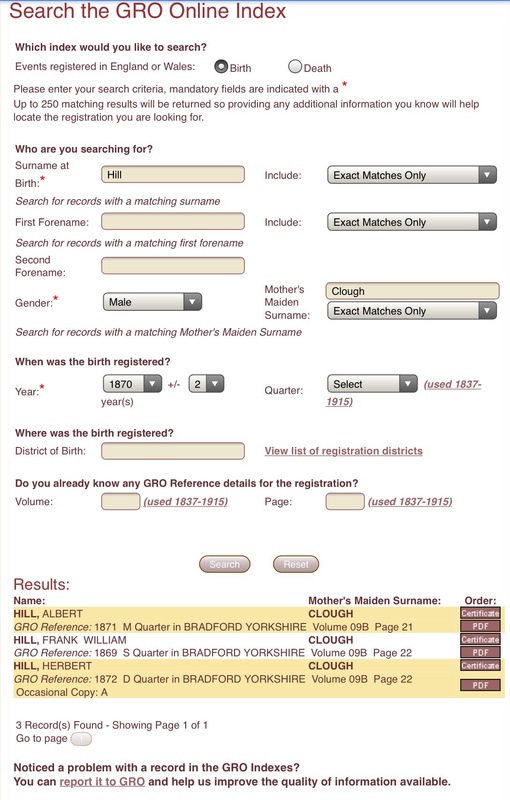 But even if you don’t find your ancestor named, they provide a fantastic insight into their work and conditions. I’m going to share a summary of this essentially old pre-Internet piece of research (updated with some more recent information) in case it helps anyone else: Either directly for those with silk industry antecedents; or indirectly to show what type of occupational information can be gleaned from primary sources. the reasons for, and decline of, child employment in this area. I will also look at the Factory Acts, and the reasons why initially they only had the partial inclusion of child silk workers. I chose 1815 as the starting point, as the end of the Napoleonic Wars marked a significant date for the English silk industry, paving the way for free trade and the lifting of protectionism. The years 1815-1820 also marked a period of recession with an influx of returning soldiers seeking employment driving wages down. And, although there was protectionism at this start point, more goods were sneaking in to the country once the Napoleonic Wars ended. 1871 is the finishing point as it coincides with the first census after the passing of the 1870 Education Act. Silk weaving reached England on a small scale in the mid-fifteenth century. It developed in the mid-sixteenth century when Spanish religious persecutions forced Flemish weavers to seek refuge in the Spitalfields area of London. However it was not until the revocation of the Edict of Nantes, which forced the French Protestant Huguenots to flee the country, that the English silk industry took off in any big way. The refugees included many skilled silk workers from Tours and Lyons, and these too settled in the Spitalfields area. In this period the industry was domestic in nature. Manufacturers employed weavers as outworkers and supplied them with yarn. These weavers then spun it on their own looms in their own homes or workshops and took the finished product back to the manufacturer who inspected and weighed it, docked money for imperfections, and paid the weaver. With the patent in 1718 of Thomas Lombe’s silk machine, which converted the filaments of raw silk into yarns and threads, the final main obstacle to English silk production was removed. Previously the silk weaving industry had to import expensive thrown silk. Now the raw silk could be imported and then turned into thrown silk in England. A rapid expansion of the silk throwing industry followed the expiration of Lombe’s patent rights in 1732. This led to the increased development of purpose-built silk throwing and spinning mills. Yet even after this date the home-based character of silk-weaving branch continued. Factory weaving did take place though, especially from the 1820s onwards when Jacquard mechanisms attached to looms enabled the weaving of ever more complex patterns. Often these were too large for a domestic situation. This, along with the development of power looms, led to an increase in factory based weaving bringing the processes of silk throwing (spinning), warping, dyeing and weaving under one roof. The protectionist attitude of the attitude of the British government meant between 1765-1826 fully manufactured silk imports were prohibited and duties on other silks were proportionately high. This gave an impetus the English industry. However this protectionism came to an end in 1826 when the importation of foreign silk goods became legal. Despite the levy of a duty of around 30% on Continental goods, it still posed a treat to the English industry, especially given the superior quality of French silks. The main areas of the silk industry in the 19th century were Lancashire and Cheshire, particularly around Manchester and Macclesfield. Other significant centres included Derby, London and Coventry. How many children in the silk industry and what did they do? For this I looked at the census figures as well as various Select Committees and Royal Commissions investigating child employment in general. 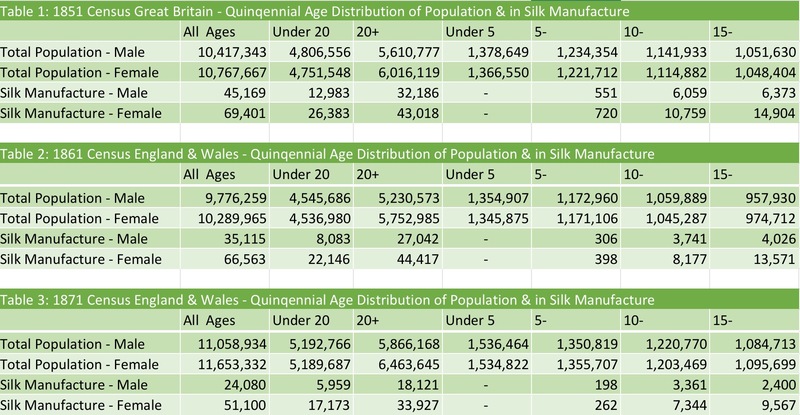 The numbers of children involved in silk manufacturing compared to the overall total population are shown in Tables 1-3. Whilst Table 1 is not directly comparable, being for Great Britain rather than England & Wales, it is illustrative. They show that the silk industry underwent a gradual but noticeable decline in adult as well as child employment. Numbers were skewed towards female operatives. Also in 1851 and 1861, when looking at overall data, the peak age for those employed in silk manufacture across both sexes was the 15- Quinquennial band. 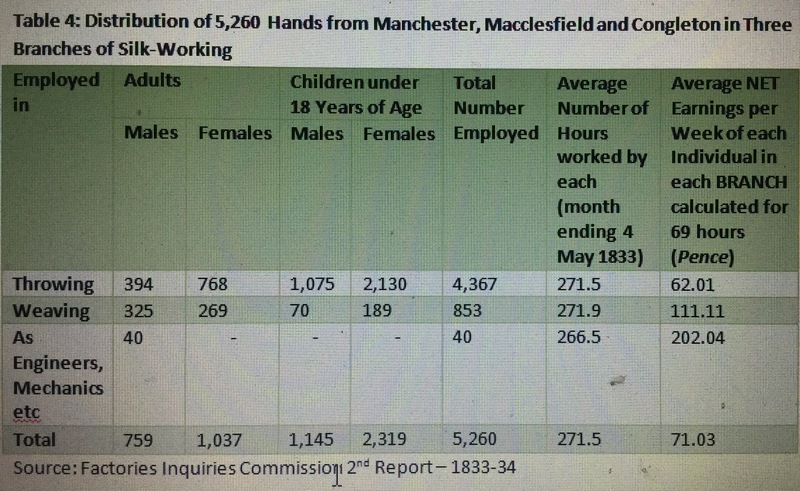 Table 4, from the Factories Inquiry Commission supplementary report of 1834, shows figures from a sample of silk factories in Manchester, Macclesfield and Congleton employing 5,260 operatives. Children were almost exclusively employed in the throwing departments. Their principal job was tying knots when the silk thread broke, each child being in charge of a certain number of threads. Various Select Committees examining child labour in factories reported on this. In 1816-17 it was estimated that a child was in charge of about 20 threads; by 1831-32 this has doubled “on account of the competition which exists between masters; one undersells the other, consequently the master endeavours to get an equal quantity of work done for less money.” By the time of the 1866 report into children’s employment it was down to 12. The children also had an element of responsibility, being accountable for the thread which passed through their hands. This was high value especially when compared to others textiles. Even if the silk was of a good quality that it would not break so often, still a great deal of vigilance was required. Other jobs included “warp picking“, that is taking small defects out of the threads of warp before the weaver receives it; picking up waste; acting as helpers to weavers; or winding in a domestic situation. By this period the silk industry was principally a factory occupation. However it did still exist in a domestic form too. I’ve already referred to the weaving side. But silk throwing, the twisting of the tread of silk from the cocoon which takes the place of spinning, could still be undertaken in the home and sent to the factories for finishing and weaving. In the same 1834 publication J.S. Ward of Bruton, Somerset, mentioned that, besides his factory employees, he employed women and children winding and twisting silk in their own homes. The raw silk was given to the undertaker who would be engaged by the factory to return the silk full weight wound, doubled or twisted. These undertakers would in turn sub-let this work “hence it is that almost every house becomes a domestic manufactury, the husband, the wife, and their children….being occupied in the upper room which is devoted to the purposes of winding, doubling or weaving.” This practice still thrived into the 1860’s. Besides being engaged as outworkers, children also played a part in handloom weaving. In the silk industry this still continued. For intricate, top quality pieces the handloom was superior to the power loom, due to the delicacy of the material. Outworkers who own looms worked by the piece for manufacturers. Children did not weave, but wound for the family. Children were generally taken from school at around the ages of nine or ten to do this. Looking at the growing factory branch of the industry, the ages at which children were employed is shown in Tables 1-3. However these are only from 1851 onwards and it is necessary to look at parliamentary papers to get an idea about ages prior to this year. In 1816-17 it appears that children worked from the age of six. By the raft of reports in the 1830’s this increased to eight. Table 4 (above) and Table 5 (below) give a flavour. Even in the 1866 report into children’s employment H.W. Lord found cases of children aged eight working, though more typically it was nine. 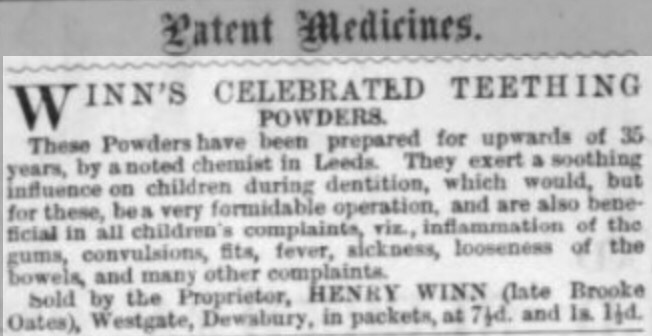 Some manufacturers in the 1830’s claimed their practice was not to take children under the age of nine or ten, but often parents would deceive them. George Senior, from the silk firm of William Harter in Manchester, said “the parents always tell the children to answer ‘going ten’ when they are asked their ages” and Stephen Brown, of Colchester, backed this up. In my next post I will examine in more detail the ages, wages, working conditions and health of these child silk industry workers. This is the third part of my look at child workers in the silk industry between 1815-1871. Earlier posts (Part 1) and (Part 2) looked at the background of the industry, numbers involved, type of work undertaken, children’s ages, their working conditions and health. In this post I will focus on the Factory Acts affecting child employment in the silk industry in this period. How far did the Factory Acts effect the silk industry? Although they included the silk industry, the most striking thing when examining the 1833, 1844 and 1847 Factory Acts is some of the most important clauses, dealing with hours and education, did not apply to the industry. The first Act which included provisions concerning the silk industry was that of 1833, which resulted from the recommendations of the Parliamentary Select Committee and Royal Commission of 1833. This Act forbade the night employment of under 18’s in a number of textile factories, including silk. Neither was the 13-18 age group to work for more than 12 hours a day or 69 a week. No child was to be employed in mills regulated by the Act until they reached the age of nine….except silk mills which could engage children regardless of age. It regulated the employment of children under 13 to nine hours a day, or 48 in a week. But in silk mills children under 13 could work 10 hours and the 48 hour rule did not apply either. The Act included overtime provisions and the circumstances in which it could be used. It also provided for one and a half hours for meals and it required children under 13 who came within the 48 hour rule to receive elementary schooling for two hours each day. It also established a minimal factory inspectorate to ensure compliance with these laws. Children employed in silk mills were therefore only afforded limited protection by the 1833 Act, for not only was it legal to work them for 10 hours a day, but they were outside the scope of the education clauses, which were limited to those whose labour was restricted to 48 hours a week. To begin with the Act was not enforced effectively because the inspectors lacked experience in factory employment and tended to work with the employers. Other obstacles included the difficulties detecting overworking of protected persons with the 15 hour limit of the working day. Children under 13 were not specifically included in the mealtime provisions, so it was legal to employ them without a break. Above 13 they were put to work cleaning machinery during their meal breaks. Superintendents only had restricted entry to the mills, while factory owners knew when the Inspector was due so had time to put their factories in order. What effect did the 1833 Factory Act have on child employment in the silk industry? Table 10 shows although a decline of children employed in silk factories took place between 1835-1838, it was only 4.9% and this could easily be attributed to the depression in the silk industry at the time. Furthermore, while children in other factories were being dismissed as age and hours provisions came into effect, these did not apply to such an extent to the silk industry, so children remained in employment. I have used a piece of later research, Table 11, to illustrate this. The problems of enforcing the 1833 Factory Act led to the 1844 Act. This included the silk industry to a slightly greater extent than the previous Act. For, besides stricter regulations governing the recovery of lost time, and tighter provision on the subject of meals, the Act stated that silk mills were to come under the same regulations as other textile factories. However there was a crucial step back modification. Whereas the Act limited the hours worked by children to six and a half per day, with three hours’ schooling, and set a maximum 12-hour day for young people between 13 and 18, children over the age of 11 engaged in winding and throwing raw silk were allowed to work ten hours a day. And these children were exempt from the schooling clauses which instigated the half time system. Because winding and throwing raw silk occupied the greatest number of children involved in the industry, this Act can once again be said to have had no great effect on child employment in this industry. The drop which did occur, 7.1% between 1838-1847, would potentially be accounted for the drop generally in the spun and waste silk branch. These provisions were retained in the 1847 Factory Act, commonly known as the Ten Hours Act, and amending Acts of 1850 and 1853. These essentially dealt with the working hours of women and young persons aged 13-18 in textiles mills. The 1847 Act reduced the hours of 13-18 year olds and women to ten per day. The 1850 Act raised the hours for women and these young people to 10.5. However, nothing was done with reference to those children over the age of 11 in the silk industry as illustrated in Section 7 of the 1850 amending Act. This repeated the provision that 11 year old children engaged solely in winding and throwing raw silk could be employed in all respects as young persons, that is 10.5 hours a day, providing they had a surgical certificate to say they had completed their eleventh year. Under 11’s had to attend school under the half time system for three hours a day. So the Factory Acts only had a limited application for children in the silk industry. And their provisions did not apply at all to those employed in a domestic situation or in unregulated factories and sheds. Therefore the Factory Acts had only a limited effect on child employment and its decline in this industry. Other factors played a part, and some of these are directly linked to the rationale behind this limited legislation. Why was legislation over child employment in the silk industry so light touch? Because these Acts were innovative and experimental, there was a gradual evolution and extension. Not everything could be done immediately. The lace industry was another branch of the textile industry which was not included. It would have been too great a step to legislate against all child employment in one go, especially when considering the significant opposition to the limited legislation. It was not feasible, practical or prudent policy. If the Acts proved workable they could gradually be extended to cover more industries/branches. The silk industry employed a large number of children as compared with other branches of the textile industry, as shown in Table 12 below. If this labour was removed it could have a disasterous effect on the silk industry. At the period of the first Factory Act, the silk industry was already declining and the previous year, 1832, a Select Committee had investigated the issues affecting the trade. Throughout the various investigations into child employment a constant theme was the peculiar circumstances pertaining to silk. 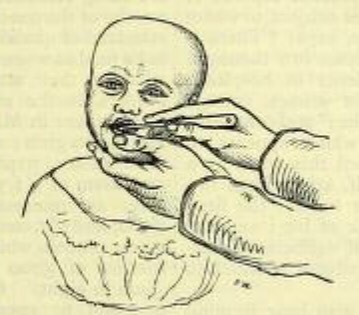 In Lord Ashley’s Royal Commission of Inquiry into child employment, established in 1840, agreed that “these children both need and are entitled to legislative protection.” However, because of the unusual conditions in mills were silk was wound and thrown, conditions which made it imperative to employ a considerable number of young hands, they felt unable to make any recommendations other than separate treatment should be considered. Hence the fact that this industry was subject to less stringent measures than other textile industries in the subsequent Factory Acts. So what were these peculiar circumstances? I will look at these in my final post. These peculiarities which ultimately played the more significant influence behind the decline of child employment here. In the first part of my look at child workers in the silk industry between 1815-1871 I gave a brief background to this industry, looked at the numbers involved and the types of job. In this part I will cover their ages, wages, working conditions and health impacts. Why did employers take children of this age? First and foremost it was permissible under the Factory Acts. However there were a number of other reasons. Furthermore quick, nimble fingers were needed to tie knots, a skill in which children had the advantage over adults. They were also cheap. Factory owners, particularly in the 1830’s, exhibited a great concern for wages. In the 1820’s there had been a progressive lowering of duties on foreign silk products which caused a depression in the English silk industry. The mill owners argued that since they had been brought into competition with foreign countries with there much cheaper labour and production costs, child employment was imperative in order to keep production costs down and enable competition: young children were necessary. “A child above 12 would generally take double the time to learn as one under, and their wages would be higher whilst they were learning and getting us nothing” claimed William Upton Lester of G.M. Lester & Sons, Newcastle-Under-Lyme in the 1834 Factories Inquiry Commission supplementary report. In fact some mill owners argued a greater number of under 12s needed to be employed as a consequence. Adult wages could not be afforded. A final reason has already been hinted at, with parental duplicity over children’s ages. In 1816-17 obliging the parents was the most common reason given for child employment. The fact that parents were prepared to lie over their children’s ages to obtain for them mill work shows this to be accurate. The parents “derived advantage from their earnings”. Children played an important part in the family economy, making a contribution to the family finances. According to David Vincent child labourers had an awareness that their contributions could make a significant difference to the well-being of the family. This applied as much to those involved in domestic industries as to those in factories. They were to be loved and economically exploited. What wages could a child expect to bring home? Naturally this varied according to the child’s age, exact employment, period in time, and whether the work was conducted in a mill or domestic situation. A child who worked alongside a parent handloom weaver would not know how much he or she earned because the winding work was tied in with the parents’ earnings for the piece. A good handloom weaver could expect to earn 18s a week in the early 19th century. Generally though wages declined after 1815, and the influx of handloom weavers from the cotton industry added to the labour pool depressing wages further. For winders in a domestic situation supplying factories, payment was by the pound. Prior to 1829 they earned on average 2s per lb, but by 1831 thus decreased to 1s, with a good worker winding 2.5lbs per week. In the factories wages varied from 1s-4s a week. Larger mills tended to pay more than smaller ones. Tables 6 & 7 illustrate wages in the mid 1820’s to 1830’s. Note the reduction in hours worked in Table 7, a result of the trade depression. These functions were only fully achievable in a domestic setting. In industry it broke down. The parent could not ensure the child was not taxed beyond his/her strength. Neither could the parent necessarily personally protect or train the child. What were the working conditions and health effects? Punishment was a feature of work, though it varied from factory to factory. The majority imposed fines for misdeeds. Most factory owners said they did not sanction corporal punishment, though did admit to occasionally using sticks across the shoulders. But the comparatively high value of silk against other textiles did influence punishment, as waste of silk was costly. There is definite evidence of harsh treatment were waste was perceived. The hours of work also varied from factory to factory, and during different periods of time. As we have seen from Table 7 depression meant short time. James Sharpley, of Brocklehursts, said hours varied from six upwards, depending on the fluctuations in the silk industry business. Early in 1833 children in his factory worked about eight hours 40 minutes a day. The number of days varied too. In 1831 some factories only worked four days a week. But when demand was good excess hours were needed “since the free trade system the work is naturally very irregular, for if a little demand rises we are so afraid of competition that we work day and night to be first in the market…..which creates an over stock, and then we are not able to work above three or four days per week.” Therefore the very precarious nature of the silk industry made it difficult to compute hours. It is difficult to judge the reality because both groups had an interest: the manufacturers didn’t want children to work less hours as it would increase production costs in an industry already susceptible to trade fluctuations. So it suited them to play down any impact to health brought about by hours and conditions; and child operatives would themselves be the beneficiaries shorter hours if they were deemed excessive. The issue is further complicated looking at it from the standards we employ today. But put into perspective a child of nine or ten working in the silk industry was working longer than most adults in today’s society. Tables 8 and 9 below chart a series of medical examinations conducted in 1833. These show overwhelmingly health in silk mills to be far better than cotton factories. Of course it is possible that these medical examinations were fixed to the extent that factory owners sent sickly children home for the day. However if this practise took place in silk mills, it would be logical to assume cotton mills did the same: yet cotton mills had a comparatively much worse record of health. It can be therefore taken that the tables provide a relatively accurate comparison of health in the two industries. But that does not mean the employment was not detrimental to health. It was also stated that those children not brought up in a factory system were more healthy. That’s the bottom line. The factory system, whatever branch, was fatiguing, unhealthy, dangerous and children were subjected to harsh treatment. In my next post I will examine in more detail the Factory Acts of 1833, 1844 and 1847 and their impact on child employment in the silk industry.